For your next corporate event in the New England area, choose the corporate catering team at Woodman’s of Essex. 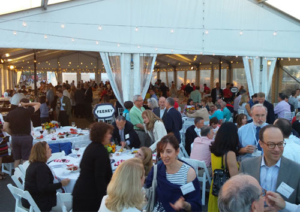 We specialize in clambake and BBQ catering, and our experience spans 100 years and five generations. So when you choose Woodman’s to cater your company event, you receive more than great food and service — you get the peace of mind that comes from working with people who know what they’re doing and who really care. 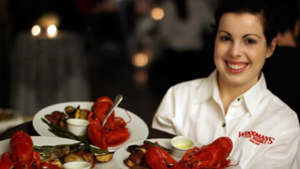 Clambake catering, BBQs, fried clams, lobster rolls and award-winning clam chowder – we do it all. Nothing says New England like the taste of Woodman’s. At Woodman’s, the traditional New England clambake always starts off with our creamy, award-winning clam chowder. Then we follow it up with a selection of clams and mussels steamed in garlic and white wine with hot drawn butter, fresh lobsters, tender steak tips, chicken or pork ribs, sweet corn on the cob and seasonal desserts made by our chefs at the Essex Room (Woodman’s on-site event venue). 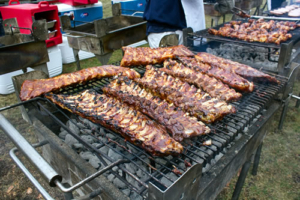 Sizzling steak tips, slow-cooked baby back ribs, “fall off the bone” rotisserie chicken, spicy BBQ shrimp, sweet Italian sausage with peppers and onions, or simple hamburgers and hotdogs – when it comes to barbeque catering, our BBQ cooks are grill masters. We offer vegetarian, gluten free and children’s options too! Call us at 978-768-6451 today to speak with our catering team about your company event, and let us help you create a custom menu for your event. When you call our office, you’ll speak with one of our expert event planners who has personal experience working as a member of the catering crew.